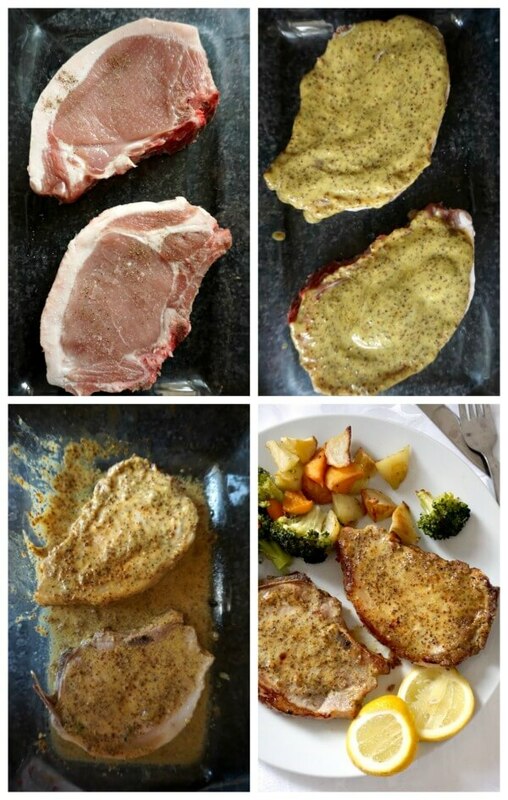 Baked Honey Mustard Pork Chops, a super delicious meal for two. Super simple to make, with a fantastic honey mustard sauce, this recipe is sheer bliss. 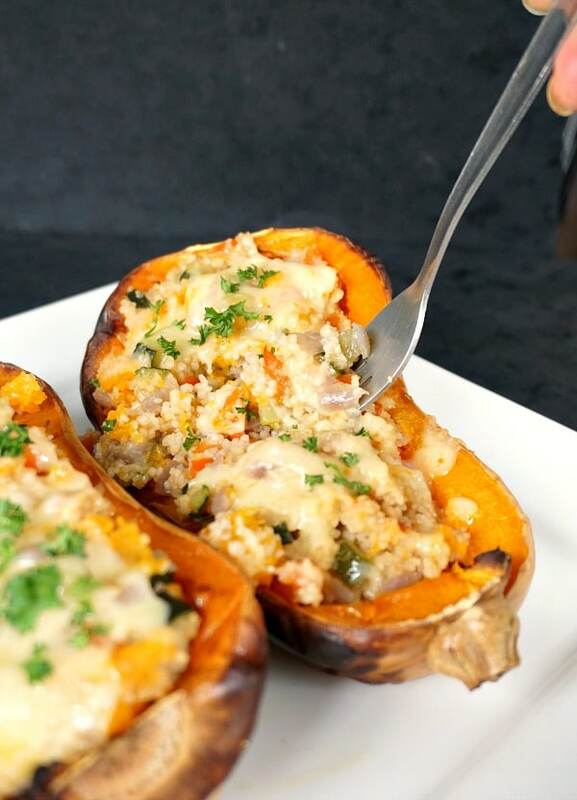 A low carb, high-protein recipe. It’s not often that I post pork recipes. Not that I don’t like pork, it’s just that I seem to eat it a lot less than I used to when I was in Romania. Over there, pork is the preferred meat during the very harsh winters. And when I say harsh, I mean freezing cold with temperatures dropping to -35 degrees Celsius or so in some parts of the country. Luckily, where my family lives, I think the coldest was about -20 degrees Celsius. Still freezing, though. So, there is no surprise why people consume fatter foods in winter. In summer time, that’s a different story, then the temperatures often go past 40 degrees Celsius. You can’t possibly even think of anything than salads and cold dishes. You really want to stay away from the kitchen. So, making these honey mustard pork chops reminded me of childhood and the delicious dishes I had. Mum might not use fancy sauces, but her food is the best in the whole wide world. And that’s a true fact. 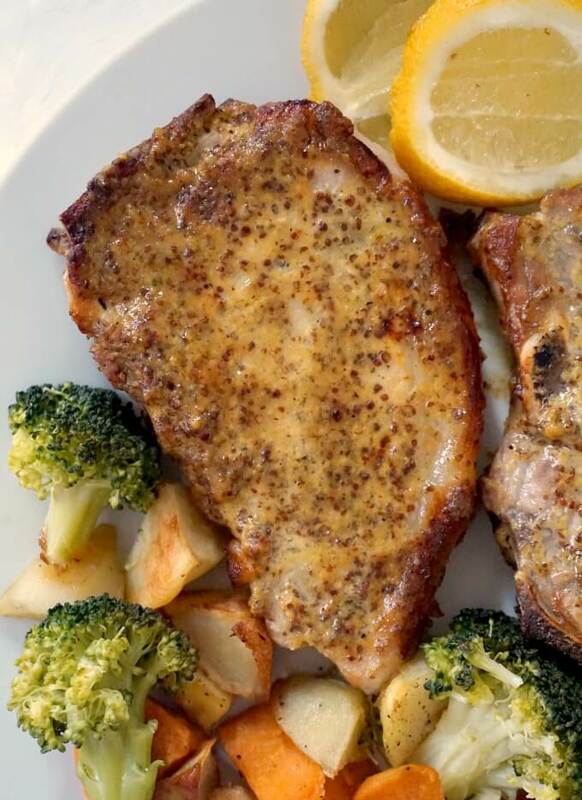 I knew that the honey mustard sauce is a winner with meat, after my out-of-this-world Baked Honey Mustard Chicken Breast with a Touch of Lemon. A year later, and it is still the most popular post on the blog. And you can tell why, it’s simply delicious. And, not at all surprising, the sauce works beautifully with pork too. These pork chops are the best I have ever had. And the prep is minimal, there is hardly any effort required. You can tell from the photo above what the prep is all about. Salt and pepper on the pork chops on both sides, in they go into an oven-safe dish, spread the honey mustard sauce over, and that’s it. Nothing else. I did not even sear them beforehand, but if you like searing the meat, you can do it. When I made the honey mustard chicken, I had to add some water into the dish to keep the chicken moist, since the chicken breasts hardly have any fat at all. But with the pork chops, there is no need for water, since the fat around them melts in the oven and keeps the meat nice and moist. This might not be a dish I’d have every day, but when I do, I fully enjoy it! Lemon juice, although optional, gives the chops a nice kick, and boosts the flavour. 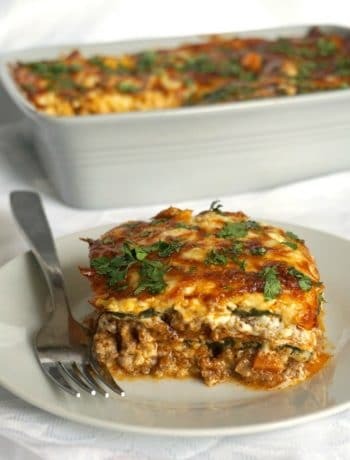 You can’t fail with this recipe, do give it a try! 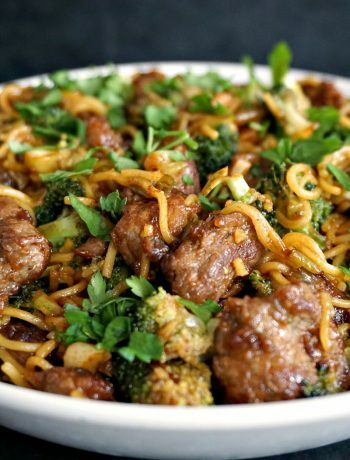 Succulent meat, delicious sauce, throw some roasted veggies and some broccoli, and there you have, a fantastic meal to lick your fingers clean. Why spend a fortune going to a restaurant, when you can have restaurant-quality food from the comfort of your own place. And no, you don’t need to be an experienced chef to make it, even a complete beginner will get it done to perfection too. It’s really simple, I am telling you. How long do you bake pork chops for? Now, there might be people who cook the pork chops for a lot less time than I did, which was about 40 minutes in the oven. Ovens can be different, so it’s worth keeping an eye on the chops anyway. But with meat, I always choose to be extra careful and would rather cook it for a bit longer, than have it undercooked. I know many will disagree with me, but I honestly don’t get the rare thing at all. Rare steak does not appeal to me in the slightest, I can’t possibly see myself eating meat in any other way than well done. I guess there is no accounting for tastes, and with that I rest my case. 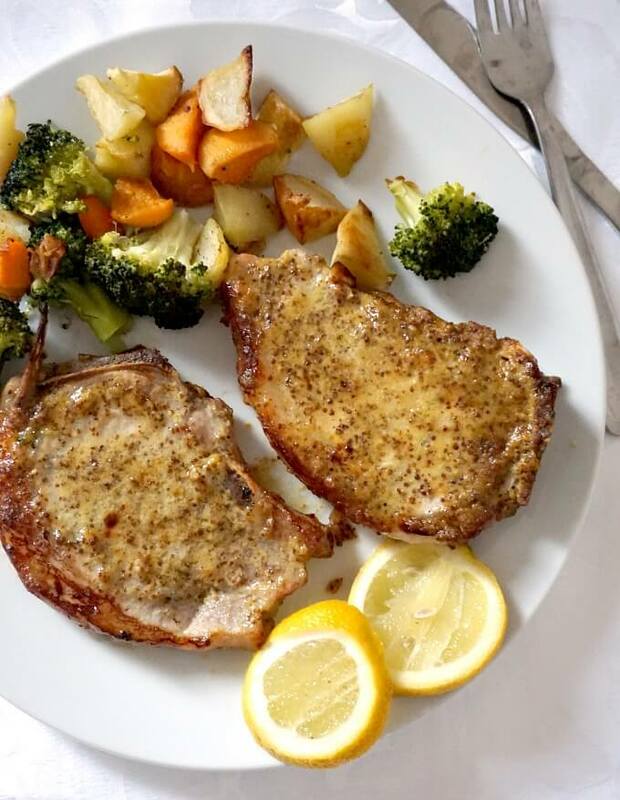 If you’ve liked my HONEY MUSTARD PORK CHOPS or any other recipe on the blog then don’t forget to rate the recipe and let me know how you got on in the comments below, I love hearing from you! You can also FOLLOW ME on FACEBOOK, INSTAGRAM and PINTEREST to see more delicious food and what I’m getting up to. 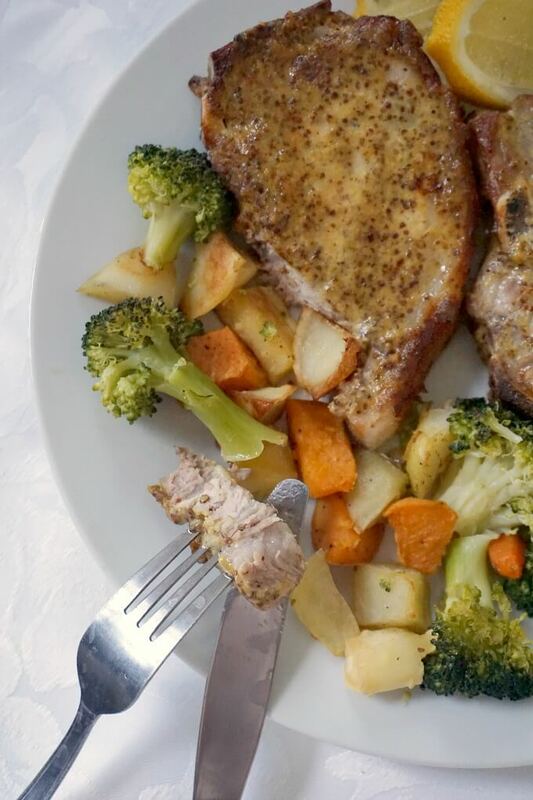 Baked Honey Mustard Pork Chops with broccoli, potatoes and carrots, a super delicious meal for two. Super simple to make, with a fantastic honey mustard sauce, this recipe is sheer bliss. Pre-heat the oven to 180 degrees Celsius (360 Fahnrenheit). 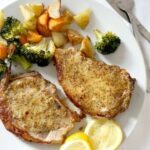 Season the pork chops with salt and pepper on both sides, and place them in an oven-proof dish. In a small bowl, mix the the wholegrain mustard, dijon mustard and honey, then brush the pork chops with it. Bake for 20 minutes, then flip the chops on the other side, and brush with some of the sauce that had formed on the pan. Bake for a further 15 minutes, then increase the temperature to 200 degrees Celsius (390 Fahrenheit) for the last 5 minutes, so it can get a nice colour. Remove from the oven, leave to rest for 5 minutes, then drizzle some lemon juice over. Ovens can be different, so keep an eye on the pork chops after 30 minutes. The chops should release enough juice, so there is not need to add any water to the pan to keep it from drying. Increasing the temperature for the last 5 minutes gives the chops a nice golden colour, but make sure the edges don't brown.